The Roma people (singular Rom; sometimes Rroma, Rrom), often referred to as gypsies, are a heterogeneous ethnic group who live primarily in Southern and Eastern Europe, Western Asia, Latin America, the southern part of the United States and the Middle East. They are believed to have originated mostly from the Rajasthan region of India. They began their migration to Europe and North Africa via the Iranian plateau about 1,000 years ago. Traditionally most Roma spoke Romani language, an Indo-Aryan language. Today, however, most Roma speak the dominant language of their region of residence. The history of the Roma has been one of continued persecution and difficulty as they have been identified as "outsiders" to the societal norms of the areas that they migrated to. They were enslaved for five centuries and scattered across continents. Despite this, their culture has remained nearly unchanged throughout the centuries, which contributes to the continued perception of mystery and "otherness." Interestingly, the Roma have a pattern of becoming members of the religious groups that are in the areas they migrate to, including Catholicism, Protestantism, Evangelicalism, Orthodox Christianity, Islam, Jewish, Seventh Day Adventist and so on. Yet, they maintain their traditional beliefs and customs. By the beginning of the twenty-first century, there has been increased effort made by some countries to be more inclusive of Roma people and their children in public health care, housing, and education, suggesting that in time the Roma will find their place within the family of humankind. 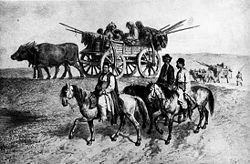 The English term "gypsies" (or "gipsies"), originates from the Greek word Αιγύπτοι (Aigyptoi), modern Greek γύφτοι (gyphtoi), in the erroneous belief that the Roma originated in Egypt. This ethnonym is not used by the Roma to describe themselves, and is often considered pejorative. However, the use of "gypsy" in English is now so pervasive that many Roma organizations use the word "gypsy" in their own names. In North America, the word "gypsy" is often misunderstood as a reference to lifestyle or fashion, and not to the Roma ethnicity. The Spanish term gitano and the French term gitan may have the same origin. In most of continental Europe, Roma are known by many names, most of them similar to the Hungarian cigány (pronounced International Phonetic Alphabet / IPA) or Ukrainian цигани. The Hungarian root, cigány may stem from the word szegény, Hungarian for "impoverished." In some archaic Hungarian dialects, szegény very closely resembles Cigány in pronunciation. Alternatively, Angus Fraser traced the earliest historical mentions of cigány, cygan, and cingari to a "very limited zone" in northwestern Transylvania, where a noble Hungarian family named Zygan lived. Fraser did not imply that Roma share Hungarian ethnicity, only that the name cigány likely originated from this small Hungarian-speaking enclave. There is no linguistic connection between the name Roma (ethnicity) and the city of Rome, ancient Rome, Romania, the Romanian people, or the Romanian language. 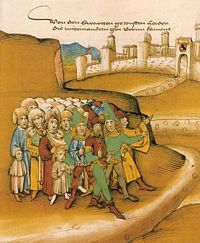 First arrival of the Roma outside Berne in the fifteenth century, described by the chronicler as getoufte heiden "baptized heathens" and drawn with dark skin and wearing Saracen style clothes and weapons (Spiezer Schilling, 749). Linguistic and genetic evidence indicates the Roma originated on the Indian Subcontinent. The cause of the Roma diaspora is unknown. One theory suggests the Roma were originally low-caste Hindus recruited into an army of mercenaries, granted warrior caste status, and sent westwards to resist Islamic military expansion. Another theory suggests that perhaps the Muslim conquerors of northern India took the Roma as slaves and brought them home, where they became a distinct community; Mahmud of Ghazni reportedly took 500,000 prisoners during a Turkish invasion of Sindh and Punjab. Why the Roma did not return to India, choosing instead to travel west into Europe, is an enigma, but may relate to military service under the Muslims. 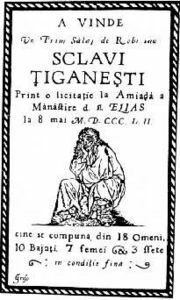 Contemporary scholars have suggested one of the first written references to the Roma, under the term Atsingani, (derived from the Greek atsinganoi), dates from the Byzantine era during a time of famine in the ninth century. In the year 800 C.E., Athanasia of Aegina (Saint Athanasia) gave food to "foreigners called the Atsingani" near Thrace. Later, in 803 C.E., Theophanes the Confessor wrote that Emperor Nicephorus I had the help of the Atsingani to put down a riot with their "knowledge of magic." Atsinganoi was used to refer to itinerant fortune tellers, ventriloquists, and wizards who visited the Emperor Constantine IX in the year 1054. The hagiographical text, The Life of St. George the Anchorite, mentions that the Atsingani were called on by Constantine to help rid his forests of the wild animals which were killing off his live stock. They are later described as sorcerers and evildoers and accused of trying to poison the Emperor's favorite hound. In 1322 a Franciscan monk named Simon Simeonis described people in likeness to the "atsingani" living in Crete and in 1350 Ludolphus of Sudheim mentioned a similar people with a unique language who he called Mandapolos, a word which some theorize was possibly derived from the Greek word mantes (meaning prophet or fortune teller). Around 1360, an independent Romani fiefdom (called the Feudum Acinganorum) was established in Corfu and became "a settled community and an important and established part of the economy." An 1852 Wallachian poster advertising an auction of Roma slaves. By the fourteenth century, the Roma had reached the Balkans; by 1424, Germany; and by the sixteenth century, Scotland and Sweden. Some Roma migrated from Persia through North Africa, reaching Europe via Spain in the fifteenth century. Both currents met in France. Roma began immigrating to the United States in colonial times, with small groups in Virginia and French Louisiana. Larger-scale immigration began in the 1860s, with groups of Romnichal from Britain. The largest number immigrated in the early 1900s, mainly from the Vlax group of Kalderash. Many Roma also settled in Latin America. Wherever they arrived in Europe, curiosity was soon followed by hostility and xenophobia. Roma were enslaved for five centuries in Romania until abolition of slavery in 1864. Elsewhere in Europe, they were subject to Ethnic cleansing, abduction of their children, and forced labor. During World War II, the Nazis murdered 200,000 to 800,000 Roma in an attempted genocide known as the Porajmos. Like the Jews, they were sentenced to forced labor and imprisonment in ghettos and concentration camps. They were often killed on sight, especially by the Einsatzgruppen on the Eastern Front. In Communist Eastern Europe, Roma experienced assimilation schemes and restrictions of cultural freedom. The Romani language and Roma music were banned from public performance in Bulgaria. In Czechoslovakia, where they were labeled as a "socially degraded stratum," Roma women were sterilized as part of a state policy to reduce their population. This policy was implemented with large financial incentives, threats of denying future social welfare payments, misinformation, and involuntary sterilization (Silverman 1995; Helsinki Watch 1991). In the early 1990s, Germany deported tens of thousands of illegal immigrants to Eastern Europe. Sixty percent of some 100,000 Romanian nationals deported under a 1992 treaty were Roma. Genetic data strongly support linguistic evidence that the Roma originated on the Indian subcontinent. Studies of Bulgarian, Baltic and Vlax Roma genetics suggest that about 50 percent of observed haplotypes belong to Y chromosome haplogroup H. Similar studies on the same subject population with mitochondrial DNA show 50 percent belong to female mitochondrial haplogroup M. Both of these are widespread across South and Central Asia. Research has shown that the original group appeared in India some 32-40 generations ago and was small, likely under 1,000 people. Bolstering the linguistic evidence for an Indian sub-continental Roma origin is that ABO blood group distribution is also consistent with that found in northern Indian warrior classes. Many fictional depictions of the Rom emphasize their supposed mystical powers or criminal nature. They often appear as stock villains, nomads, or a sort of supernatural Deus ex machina. Worldwide, there are an estimated eight to ten million Roma, most of whom reside in Europe. Although the largest Roma populations are found in the Balkan peninsula, significant numbers may also be found in the North America, the former Soviet Union, western and central Europe, the Middle East, and North Africa. Countries where Roma populations exceed half a million are Romania, Egypt, Spain, Bulgaria, Slovakia, the United States, Mexico, Brazil and Argentina. Some other countries with large Roma populations are the countries of the former Yugoslavia, the Czech Republic, Hungary, Germany, Greece, Italy, Moldova, Poland, Portugal, Slovakia, and Turkey. Each of these main divisions may be further divided into two or more subgroups distinguished by occupational specialization or territorial origin, or both. Most Roma speak Romani, an Indo-Aryan language likely derived from Sanskrit. 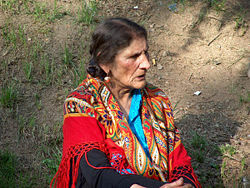 Romani is also related to Pothohari, a language spoken in the Pakistani Punjab region. A 2003 study published in Nature suggests Romani is also related to Sinhalese,  presently spoken in Sri Lanka. Today, however, most Roma speak the dominant language of their region of residence. Romani is not currently spoken in India. 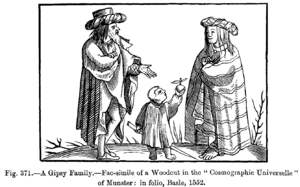 A Gypsy Family - Facsimile of a woodcut in the "Cosmographie Universelle" of Munster: in folio, Basle, 1552. The traditional Roma place a high value on the extended family. Roma law establishes that the man’s family must pay a dowry to the bride's parents. Virginity is essential in unmarried women. Both men and women often marry young; there has been controversy in several countries over the Roma practice of child marriage. In 2003, one of the many self-styled Roma tribal "kings," Ilie Tortică, banned his subjects from entering their children into marriage until they have come of legal age. This ban has been seen by some as being in direct conflict with traditional Roma family practices. A rival Roma patriarch, Florin Cioabă, ran afoul of Romanian authorities in late 2003, when he married off his youngest daughter, Ana-Maria, aged 12, well below the legally marriageable age in Europe. Roma social behavior is strictly regulated by purity laws (marime or marhime), still respected by most Roma and among Sinti groups by the older generations. This regulation affects many aspects of life, and is applied to actions, people, and things: parts of the human body are considered impure: the genital organs, because they produce impure emissions, and the lower body. Fingernails and toenails must be filed with an emery board, as cutting them with a clipper is taboo. Clothes for the lower body, as well as the clothes of menstruating women are washed separately. Items used for eating are also washed in a different place. Childbirth is considered impure, and must occur outside the dwelling place. The mother is considered impure for 40 days. Death is seen as impure, and affects the whole family of the dead, who remain impure for a period of time. Many of these practices are also present in Hindu cultures such as those of Bengal and the Balinese. There are very similar practices found in Judaism. However, in contrast to the Hindu practice of cremating the dead, Roma dead must be buried. However, it should be noted that many South Indian Hindu communities also bury their dead. It is possible that this tradition was adapted from Abrahamic religions after the Roma left the Indian subcontinent. Roma have usually adopted the dominant religion of the host country while often preserving their particular belief systems and indigenous styles of worship. Most Eastern European Roma are Catholic, Eastern Orthodox Church, or Muslim. Those in Western Europe and the United States are mostly either Catholic or Protestant. Most Roma in Latin America are Orthodox. In Turkey, Egypt, and the southern Balkans, the Roma are split into Christian and Muslim populations. Roma religion has a highly developed sense of morality, taboos, and the supernatural, though it is often denigrated by organized religions. It has been suggested that while still in India the Roma people belonged to the Hindu religion, this theory being supported by the Romani word for "cross," trushul, which is the word which describes Shiva's trident Trishula. Since World War II, a growing number of Roma have embraced Evangelical movements. For the first time, Roma became ministers and created their own, autonomous churches and missionary organizations. In some countries, the majority of Roma now belong to the Roma churches. This unexpected change has greatly contributed to a better image of Roma in society. The work they perform is seen as more legitimate, and they have begun to obtain legal permits for commercial activities. Evangelical Roma churches exist today in every country where Roma are settled. The movement is particularly strong in France and Spain; there are more than one thousand Roma churches (known as "Filadelfia") in Spain, with almost one hundred in Madrid alone. In Germany, the most numerous group is that of Polish Roma, having their main church in Mannheim. Other important and numerous Romani assemblies exist in Los Angeles, Houston, Buenos Aires, and Mexico. Some groups in Romania and Chile have joined the Seventh-day Adventist Church. In the Balkans, the Roma of Macedonia, Kosovo, and Albania have been particularly active in Islamic mystical brotherhoods Sufism. Roma music is very important in Eastern European cultures such as Bosnia-Herzegovina, Serbia-Montenegro, Macedonia, Hungary, Russia, and Romania, and the style and performance practices of Roma musicians have influenced European classical composers such as Franz Liszt and Johannes Brahms. The lăutari who perform at traditional Romanian weddings are virtually all Roma, although their music draws from a vast variety of ethnic traditions—for example Romanian, Turkish, Jewish, and Slavic—as well as Roma traditions. Probably the most internationally prominent contemporary performer in the lăutar tradition is Taraful Haiducilo. Many famous classical musicians, such as the Hungarian pianist Georges Cziffra, are Roma, as are many prominent performers of manele. The distinctive sound of Roma music has also strongly influenced bolero, jazz, flamenco, and Cante Jondo in Europe. European-style Gypsy jazz is still widely practiced; one who acknowledged this artistic debt was Django Reinhardt. Later, Roma people who came to the Americas contributed to almost every musical style. Salsa music, rumba, mambo, and guajira from Cuba, the tondero, zamacueca, and marinera from Peru, mariachi music from Mexico, llanero from the borders of Venezuela and Colombia, and even American country music have all been influenced by their mournful violins and soulful guitar. Roma arrivals at the Belzec death camp await instructions. Because of a false image that they like to steal and kill innocent animals and refuse to live like normal people, there has been a great deal of mutual distrust between the Roma and their more settled neighbors. Persecution of Roma reached a peak during World War II in the Porajmos. There are still tensions between the Roma and the majority populations around them. Common complaints are that Roma steal and live off social welfare, and residents often reject Roma encampments. In the UK, "travelers" (referring to Irish Travelers and New Age Travelers as well as Roma) became a 2005 general election issue, with the leader of the Conservative Party promising to review the Human Rights Act 1998. This law, which absorbs the European Convention on Human Rights into UK primary legislation, is seen by some to permit the granting of retrospective planning permission. Severe population pressures and the paucity of "Greenfield land" (undeveloped) sites have led to "travelers" purchasing land, and setting up residential settlements almost overnight, thus subverting the planning restrictions imposed on other members of the community. "Travelers" argued in response that thousands of retrospective planning permissions are granted in Britain in cases involving non-Roma applicants each year and that statistics showed that 90 percent of planning applications by Roma and "travelers" were initially refused by local councils, compared with a national average of 20 percent for other applicants, disproving claims of preferential treatment favoring Gypsies. They also argued that the root of the problem was that many traditional stopping-places had been barricaded off and that legislation passed by the previous Conservative government had effectively criminalized their community, for example by removing local authorities’ responsibility to provide sites, thus leaving the "travelers" with no option but to purchase unregistered new sites themselves. In Denmark there was much controversy when the city of Helsingør decided to put all Roma students in special classes in its public schools. The classes were later abandoned after it was determined that they were discriminatory, and the Roma were put back in regular classes. During the Enlightenment, Spain briefly and unsuccessfully tried to assimilate the Roma into the mainstream population by forcing them to abandon their language and way of life; even the word gitano was made illegal. 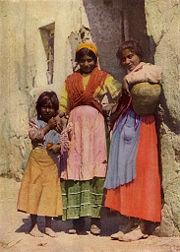 Many nations have subsequently attempted to assimilate their Roma populations. The popular image of Roma as tramps and thieves unfit for work contributed to their widespread persecution. This belief is often cited as the etymological source of the term gyp, meaning to "cheat," as in: "I got gypped by a con man." The German name Zigeuner is often thought through popular etymology to derive either from Ziehende Gauner, which means 'travelling thieves', or from the Hungarian Cigány from their word "szegény" meaning "poor." The validity of these derivations, however, is disputed. In Central and Eastern Europe, Roma often live in depressed squatter communities with very high unemployment, while only some are fully integrated in the society. However, in some cases—notably the Kalderash clan in Romania, who work as traditional coppersmiths—they have prospered. Although some Roma still embrace a nomadic lifestyle, most migration is actually forced, as most communities do not accept Roma settlements. Many countries that were formerly part of the Eastern bloc and former Yugoslavia have substantial populations of Roma. The level of racial integration of Roma into society remains limited. In these countries, they usually remain on the margins of society, living in isolated ghetto-like settlements. Only a small fraction of Roma children graduate from secondary schools, although during the Communist regime, at least some of these countries forced all children to attend school, and provided them, like other citizens, with all required basics such as textbooks and the compulsory uniform. Usually they feel rejected by the state and the main population, which creates another obstacle to their integration. According to The Guardian (January 8, 2003): "In the Czech Republic, 75 percent of Roma children are educated in schools for people with learning difficulties, and 70 percent are unemployed (compared with a national rate of 9 percent). In Hungary, 44 percent of Roma children are in special schools, while 74 percent of men and 83 percent of women are unemployed. In Slovakia, Roma children are 28 times as likely to be sent to a special school than non-Roma; Roma unemployment stands at 80 percent." In some countries, dependence on social security systems is part of the problem. For some Roma families, it may be preferable to live on social security, compared to low-paid jobs. That creates many new problems: anger against Roma, conditions that produce crime, and extreme sensitivity to changes in social security. A good example of the latter is Slovakia, where reduction of social security (a family is paid allowance only for the first three children) led to civil disorder in several Roma villages. In most countries within or applying to join the European Union, Roma people can lead normal lives and may integrate into the larger society. Nevertheless, the Roma most visible to the settled community are those that for various reasons, including traditional avoidance of "pollution" by close contact with non-Roma (cultural standards of cleanliness among the Roma state that non-Roma are mahrime, or spiritually unclean, and are therefore avoided as well as out of fear of persecution), still live in shacks (usually built ad hoc, near railways) and beg on the streets, perpetuating the negative image of the Roma. The local authorities may try to help such people by improving infrastructure in their settlements and subsidizing families further, but such aid is mostly viewed by the Roma as superficial and insufficient. Begging with pre-school children is still practiced in various areas and cities by the Roma despite its illegality in many countries. There is a sizable minority of Roma people in Romania, 1.8 million to 2 million. They are not well-accepted and many hate groups perpetrate acts of violence against the Roma population. The problem in Romania with the Roma is intensifying, and the rise of hate groups such as Noua Dreaptă will only result in more acts of violence by both sides. By the end of the twentieth century, Roma ghettos had appeared in the Czech Republic. The Roma moved there, both voluntarily and involuntarily, when municipalities forcibly relocated them from other areas. The majority of those living there are unemployed and uneducated, and the crime rate is high. As the ghetto develops, non-Roma people move away. The most infamous ghetto in the Czech Republic is Chánov, in the city of Most. This location is named after nearby village Chánov, administrative part of village Obrnice. The settlement is geographically separated part from the 2 km distant rest of Most. During 1976- 978 12 large paneláks (concrete tenements) with 380 fully equipped apartments, school buildings, and infrastructure were built to accommodate people from houses in Most that had been torn down to make a place for mining. The intention was to create an exemplary community for Roma, who had been living scattered throughout Most in low quality housing, and to prove that the socialist state was able to integrate them. A government commission visiting Chánov in 1985 found most of the flats devastated and the people living in isolation from the rest of the city. About 50 apartments were abandoned. The commission recommended not to concentrate Roma in one place, to bring in ethnic Czechs and to reconstruct the place. Since the 1990s, more Roma moved into Chánov while the remaining Czechs moved out, creating a de-facto ghetto. The Roma, many newly arrived from Slovakia, often lacked the skills to assimilate, had low or no education and were unemployed (90 percent in 2006). The real number of the Roma people in Hungary is a disputed question. In the 2001 census only 190,000 people called themselves Roma but sociological estimates give much higher numbers (about 5-10 percent of the total population). Since World War II, the number of Roma people is increasing rapidly, septupling in the last century. Today every fifth or sixth newborn Hungarian child belongs to the Roma minority. Estimates based on current demographic trends claim that in the year 2050 15-20 percent of the population (1.2 million people) will be Roma. Roma (called cigányok or romák in Hungarian) suffer particular problems in Hungary. School segregation is an especially acute one, with many Roma children sent to classes for pupils with learning disabilities. Currently slightly more than 80 percent of Roma children complete primary education, but only one third continue studies into the intermediate (secondary) level. This is far lower than the more than 90 percent proportion of children of non-Roma families who continue studies at an intermediate level. The situation is made still worse by the fact that a large proportion of young Roma are qualified in subjects that provide them only limited chances for employment. Less than one percent of Roma hold higher educational certificates. Their low status on the job market and higher unemployment rates cause poverty, widespread social problems, and crime. Before 1948, there was an Arabic-speaking Roma community in Jaffa, whose members were noted for their involvement in street theater and circus performances. They are the subject of the play "The Gypsies of Jaffa" (Hebrew: הצוענים של יפו), by the late Nissim Aloni, considered among Israel's foremost playwrights, and the play came to be considered a classic of the Israeli theater. Like most other Jaffa Arabs, this community was uprooted in April 1948, and its descendants are assumed to be presently living in the Gaza Strip refugee camps. It is unknown to what degree they still preserve a separate Roma identity. Another Roma community is known to exist in East Jerusalem, its members complain of prejudice and discriminatory treatment by the surrounding Palestinian society despite their sharing in the hardships of those Palestinians. 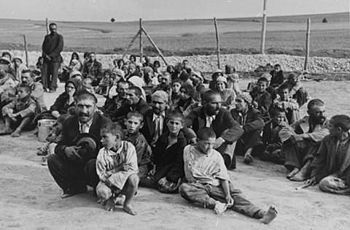 Some Eastern European Roma are known to have arrived in Israel in the late 1940s and early 1950s, having intermarried with Jews in the post-WWII "displaced persons camps" or, in some cases, having pretended to be Jews when Zionist agents arrived in those camps. The exact numbers of these Roma living in Israel are unknown, since such individuals tended to assimilate into the Israeli Jewish environment. In Europe, where the settled lifestyle has long been the norm, other non-Indo-Aryan nomadic peoples (not originating in India), have also been labeled "Gypsies" for convenience or by accident. The Roma used to refer to some of these groups as didicoy. In Germany, Switzerland, France, and Austria there also exist so-called "white gypsies" who are known under the names of Jenische (German), Yéniche (French), and Yenish or Yeniche (English). Their language seems to be grammatically identical with other (Swiss) German dialects; the origin of the lexicon, however, incorporates German, Romani language, Yiddish, and other words. Dracula by Bram Stoker features a group of Gypsies working for the Count, as they were often retainers (or serf/slaves) of noble families. The Lyre of Orpheus by Robertson Davies features major characters who maintain Gypsy traditions, including the care and repair of musical instruments, in modern Canada. Tabor ukhodit v nebo (1975, USA name: Queen of the Gypsies), film by Soviet (Moldovan) director Emil Loteanu. An excellent look at migrant Roma traditions. King of the Gypsies (1978), a film set among a group of gypsies in the United States, in which a young man first rebels against, then embraces his gypsy heritage. In the 1937 film classic Heidi starring Shirley Temple, gypsies appeared in the stereotypical villain role. Marlene Dietrich starred in Golden Earrings (1947) as a gypsy whose clan aids British agent Ray Milland escape from the Nazis during WWII. ↑ See for example the Dictionnaire de l'Académie française. ↑ Indian studies. The Lost Tribes of Israel. Retrieved on January 23,2007. ↑ Gypsy Culture. Retrieved on January 24, 2007. ↑ A Chronology of significant dates in Romani history. Retrieved on January 24, 2007. ↑ Genetics of the Roma (Gypsies) Western Australian Institute for Medical Research Inc., (2004). Retrieved January 23, 2007. ↑ D. Gresham, "Origins and divergence of the Roma (Gypsies)." American Journal of Human Genetics 69/6 (2001): 1314-1331. ↑ Malcomb Brabant, Roma rivalry over child bride ban BBC News. Retrieved January 28, 2007. ↑ Gypsies and Irish Travelers: The facts Commission for Racial Equality. Retrieved January 21, 2007. ↑ This Week's Highlights - Gypsies2005. BBC Inside Out - South East: Monday. Retrieved January 21, 2007. ↑ Roma-politik igen i søgelyset Politik. 2006. Retrieved January 21, 2007. ↑ Gary Younge, Shame of a continent The Guardian, 2003. Retrieved January 21, 2007. ↑ Noua Dreaptă Retrieved January 21, 2007. ↑ Government commission report on Chanov in Czech Retrieved January 28, 2007. ↑ Members of European Parliament Hear Testimonies of Rights Abuse of Roma in Kosova European Roma Rights Center. Retrieved January 26, 2007. Auzias, Claire. 2002. Les funambules de l'histoire. Baye: Éditions la Digitale. Genner, Michael. 1980. Spartakus, 2 vols. Munich: Trikont. Gresham, D. et al. "Origins and divergence of the Roma (Gypsies)." [American Journal of Human Genetics 69/6 (2001): 1314-1331. http://hpgl.stanford.edu/publications/AJHG_2001_v69_p1314-1331.pdf] Retrieved August 20, 2007. Helsinki Watch. 1991. Struggling for Ethnic Identity: Czechoslovakia’s Endangered Gypsies. New York. Kalaydjieva, Luba et al. "Patterns of inter- and intra-group genetic diversity in the Vlax Roma as revealed by Y chromosome and mitochondrial DNA lineages." European Journal of Human Genetics 9 (2001): 97-104. http://hpgl.stanford.edu/publications/EJHG_2001_v9_p97.pdf]Retrieved August 20, 2007. McDowell, Bart. 1970. Gypsies, Wanderers of the World, National Geographic Society. ISBN 0870440888. Roberts, Samuel. 1842. The Gypsies: Their Origin, Continuance, and Destination, 4th edition. London: Longman. Silverman, Carol. “Persecution and Politicization: Roma (Gypsies) of Eastern Europe.” Cultural Survival Quarterly (Summer 1995). Tebbutt, Susan. Sinti and Roma in German-speaking Society and Literature. Oxford: Berghahn, 1998. Tousi, Firdawsi. Shah-Nameh (book of Kings) c1000 C.E. Turner, Ralph L. "The Position of Romani in Indo-Aryan." Journal of the Gypsy Lore Society 3rd Ser., 5/4 (1926): 145–188. “Germany Reaches Deal to Deport Thousands of Gypsies to Romania,” Migration World Magazine (1992). "Gypsies, The World's Outsiders." National Geographic (2001) 72-101.